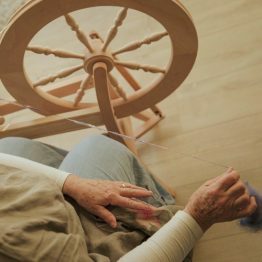 Dyeing fleece, an essential technical and creative skill, along with fibre choice, colour skills, spinning technique and yarn architecture, is a basic element of yarn design and a sure way to lift the spirits! Dyeing is with Ashford Dye and the technique is called rainbow dyeing and described in the book. The curly fleece is Teeswater and it was plyed with the commercial skein of wool(right of the fleece picture) which is leftover stock from a wool shop that closed over 20 years ago – the best environmental policy is re-use, not recycle in my opinion. The finished yarn lifts my spirits, as did the process of spinning and plying it. A joyful time – maybe I should call the yarn ‘Joy’ as it was spun on a Ashford Joy wheel discounts for pupils-please askwith a freedom flyer. Colour skills are one of the basic elements of yarn design that form chapters in my new book: Hand spinning -essential technical and creative skills.Buy All spinners are yarn designers whether they think about it or not. Unless one thinks about it, yarn design is simply the default position: i.e ‘That’s how I spin’, hence the personal opportunity to create a truly unique yarn is lost. Part of the Teeswater yarn design was aimed at maintaining the natural curly textural appearance of the fleece, and so there was no carding before spinning. The only preparation after dyeing fleece was to separate out the individual locks and remove any debris. The spinning technique was to draw out away from, not towards, the orifice. 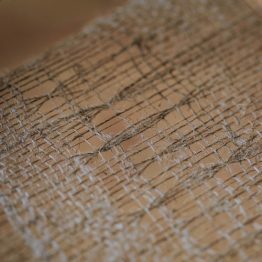 This gives the opportunity to add or release fibres as necessary in oder to create the look I want – and to see what it is like before it disappears down the orifice onto the bobbin. If I allowed the tension of the wheel to draw the fibres in and simply pushed fibre towards the orifice there would be little or no opportunity to see what I had spun and hence no chance of influencing the final appearance of the yarn. Finally it was plyed with the commercial skein which was dyed with Ashford Dyes at the same time as the Teeswater and other fleece, in the same dye bath- dyeing fleece.